They say that Friday the 13th is supposed to bring bad luck, but the residents of NEPA would disagree. Apr. 13 has finally ended the winter-like cold and winds and has brought us nearly 80 degree weather and sunshine. 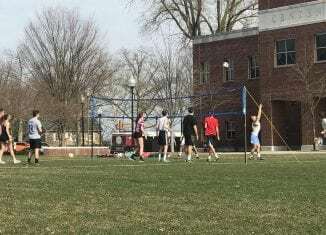 I am writing this article as I sit on a blanket on BU’s quad as students surrounding me are playing frisbee and volleyball, reading, soaking in the sun, lounging on hammocks, and just embracing the warm weather. Any weather app you check says the weather isn’t going to last long. But, based on my surroundings at the moment, I’m hopeful that Spring is near. So, log off of Netflix, crawl out of your bed, and enjoy today’s beautiful weather while you can!